Here’s Anne with her Olympus OMD EM10 MkII in a Nauticam housing. The lens she is using is an Olympus 8mm Fisheye which only needs quite a small dome port when used underwater. Non-fisheye lenses (rectilinear lenses) need larger dome ports. A tip when posing for shots like this, look at your reflection in the photographer’s dome to see whether you are in the right position. Why won't my camera focus at all? There can be a number of reasons why a camera won’t focus when used underwater. But if it only happens when you are using it with a dome port it’s most likely because of an issue involving how domes work in underwater photography. This is the bit that people often struggle with, but to be honest it isn't essential that you understand it to use a dome port or lens. Essentially, domes use a quirk of optical physics that causes a virtual image to form as light passes from water through the dome material to the air in the dome. Your camera then focuses on the virtual image which to it will appear to be a short distance in front of the dome. Issues occur with lenses that don’t focus close enough for the camera to focus on the image. Users of interchangeable lens cameras may find they have to add diopters on to their camera to be able to use some lenses behind a dome. Diopters in this case are add-on lenses that shorten the focusing distance. The larger the dome you are using the further away the image will appear to the camera and the less likely you are to need a diopter. In circumstances where one might have a dome port or domed wet lens on a compact camera housing it may be neccessary to put the camera in macro mode to get it to focus. Not neccessarily my best work, but just to show that you don’t need a dome to take a split shot this picture was taken by me some years ago using an Inon flat fronted wide angle wet lens. Always bear in mind that domes need to be a specific distance from the camera lens to give the best results. To ensure that you get the appropriate dome and extension rings to suit a lens you will need to consult the relevant port table from your housing’s manufacturer. A better option to avoid risk of a purchasing error is to consult a dealer before buying, they will likely know their way around the port tables and be able to advise you on whether your lens is the best option for underwater. Also if you give them the details of your camera, lens and housing it will fall at their door if they don’t sell you the correct port. When using cameras with zoom lenses in an underwater housing you may have to zoom in somewhat to remove vignetting when shooting with a wide angle wet lens. This is the case with the G7X MkII in Fantasea housing and is the main reason we recommend the G9X MkII instead. Why are my wide angle pictures blurred around the edges? Having the centre of your picture in focus but the edges distorted or blurred is a very common issue when using a dome port or domed wet lens. It stems from using a wide aperture (small f number setting) on your camera. I’ll be honest my optical physics knowledge isn’t up to explaining why this happens but it means that you are limited as to how wide you can set your cameras aperture. 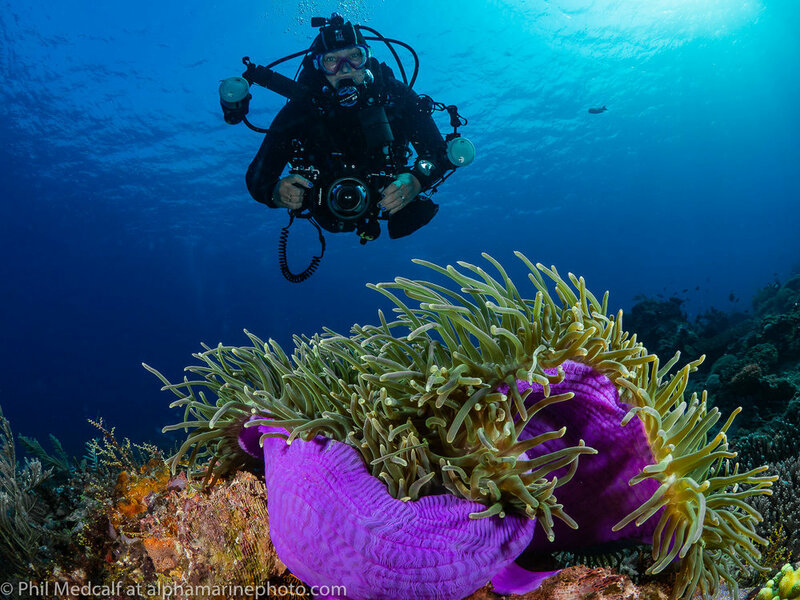 This issue is another reason why having manual control of your camera’s settings is so important for underwater photography. If you keep your camera set in a mode where aperture is controlled automatically while using a dome port or domed wet lens you may find that you are getting blurred edges to a lot of your images. If you do notice distortion at the edges of your pictures try reducing the size of aperture you use by increasing the f number it is set to in Aperture priority or full Manual mode. This issue is more pronounced with larger sensor cameras so you will likely need a smaller aperture when using a full frame camera with a dome port than you may do when using a Micro Four-Thirds sensor camera. Have a read of my previous blog ‘Automatic for the People?’ to understand more of the issues surrounding using your camera in Auto while underwater. How can I remove the scratches on my domed wet lens? This is a question I’ve seen a few times and I try and answer it as quickly as possible before any harm can be done. It is possible to polish scratches out of acrylic dome ports like this Nauticam one. While glass domes are harder to remove scratches from but somewhat more resistent to being scratched. Firstly, if you can’t see the scratches in your pictures then leave things alone. Damage too small to show in a picture is unlikely to affect the structural integrity of your lens. If it does show up in your pictures then you have an issue. While dome ports for housings are made of acrylic or glass almost all the domes used on wide angle wet lenses are made from coated polycarbonate. Unfortunately if you try and use a polishing system such as Novus (which works well on acrylic dome ports) to remove scratches from these coated domes you’ll damage the coating and likely make whatever is showing up in your pictures much worse. Instead you’ll almost certainly have to return your lens to the manufacturer for the dome to be replaced. Unless you are happy to spend a lot of time in front of your computer editing the marks out of your pictures. That concludes my first little compilation of answers to underwater photography questions. I hope you found it useful. If you have questions you’d like answering why not join the Alphamarine Q and A group. Check out our events page for dates of our courses if you’d like some more in depth education in underwater photography or photo editing. Use our contact sheet to get in touch for any other information including booking us to do a club talk or if you are interested in buying equipment from us.